It’s time for another WordPress plugin development tutorial 🙂 In this post, I will provide a step-by-step explanation of how to create a WordPress plugin that lets the user add an automatically generated table of contents (TOC) to their posts by using a simple shortcode. 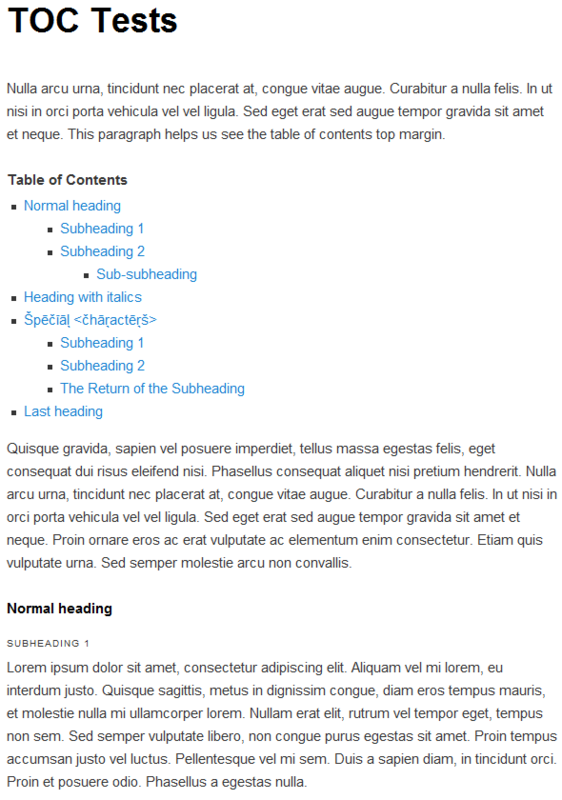 For example, the table of contents for this post was generated by this plugin. Sample post (txt). Useful for testing the plugin. Just copy the HTML code into a new post. Generate a hierarchical TOC based on heading tags. 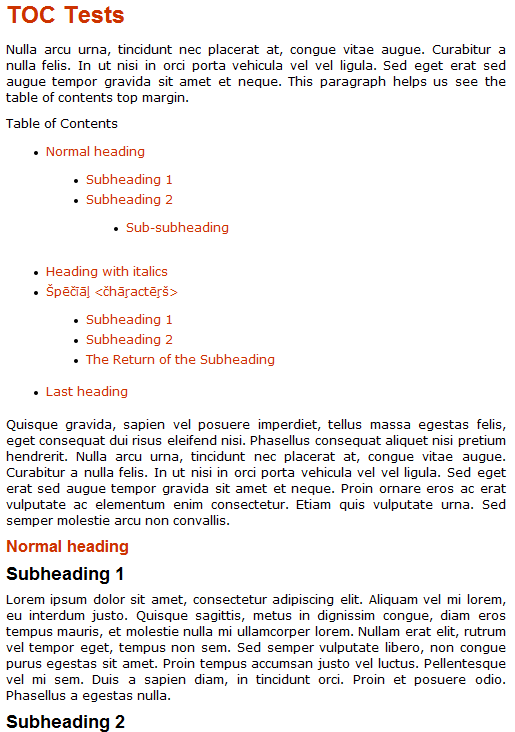 Let the user decide which heading levels (H1-H6) to include in the TOC. Basic styling for the TOC. I will briefly discuss other possible features and improvements at the end of this article. Another thing that we need to figure out is what version(s) of PHP and WordPress are we going to support. This will affect what PHP features and WP APIs we’ll be able to use. Again, lets keep it simple and stick to WP 3.3+ and PHP 5.2+. Being able to use PHP 5.3 features like closures would be nice, but most WordPress users are probably still on 5.2.x and wouldn’t be able to run the plugin if it used 5.3 specific syntax. Finally, we’ll need a name – or at least a working title. Let’s go with “Easy TOC”. First, let’s get the basic plugin header in place. This will allow us to activate the plugin in WordPress right away and test and debug it as we go. I’ll also add a skeleton of the main plugin class. 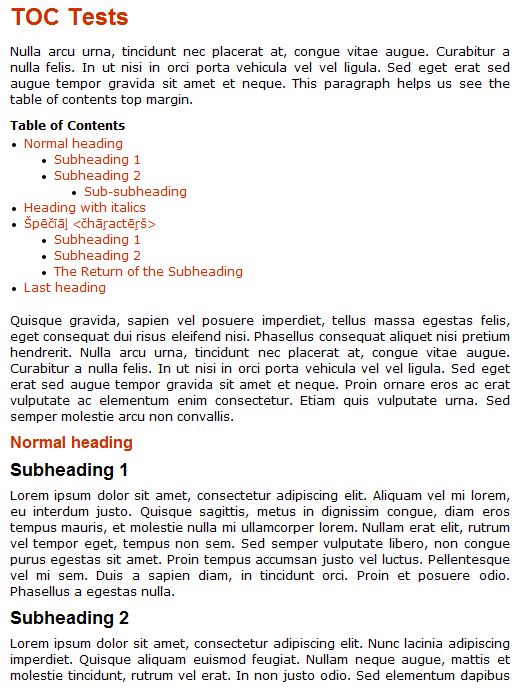 * Description: Insert a table of contents into your posts by using a [toc] shortcode. 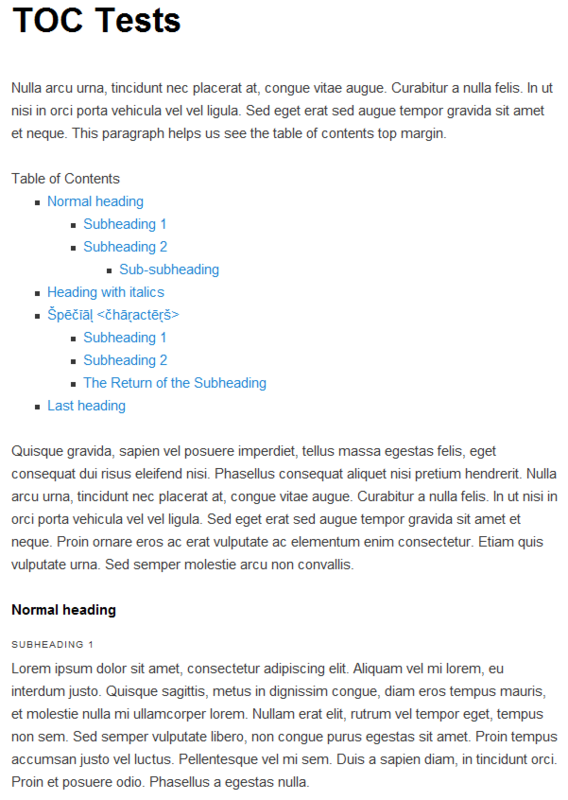 For reference: WordPress File Headers. You may notice that I’ve left out the closing “?>” tag. This is intentional. The end-of-file closing tag is optional and omitting it helps prevent accidental “headers already sent” errors. See also: more reasons to omit the closing PHP tag. Find and parse the [toc] shortcode to figure out which heading levels to include in the TOC, what title to use (if any), and so on. Parse the current post for eligible heading tags and build a list of TOC entries. Add an anchor name to each heading so that we can link to it from the table of contents. Anchors must be unique. We can’t do everything inside a shortcode callback because #3 involves modifying the entire post. So we will generate the TOC in two large steps – first, parse the shortcode, store its attributes, and replace it with a temporary placeholder. Then, in a separate “the_content” hook, process the headings, build the TOC and replace the placeholder we created earlier with the result. //Only display the TOC on single posts and pages, not archives. //We'll use these settings later. We register the [toc] shortcode using the add_shortcode() API function and set the doTocShortcode() method as the callback. The callback parses shortcode attributes (using sensible defaults) and stores them in a private field. Finally, it replaces the shortcode with a placeholder string that acts as a marker for where to insert the TOC. Next, we’ll scan the post for headings and prepare a list of TOC entries. We can use the well-known “the_content” filter to intercept and modify the post’s content. The WordPress core function that processes shortcodes is also attached to this filter and runs at priority 11. We will attach our own hook with priority 20 to make sure it runs after the [toc] shortcode has already been processed. add_action('the_content', array($this, 'insertToc'), 20); //Run after shortcodes. //Replace the marker with the actual table of contents. //Each TOC entry needs a unique anchor. //For in-page links, <elem id="..."> is preferred to <a name="..."></a>. Okay, let’s go through the above code step-by-step. insertToc() is very simple as it delegates all the real work to other methods. If the post contains our placeholder string, insertToc() builds a table of contents based on the shortcode attributes retrieved by doTocShortcode() and inserts it into the post. If not, it returns the post without modification. collectTocEntries() is a utility function that scans an input string for heading tags and uses them to generate a list of TOC entries. It also adds an anchor target to each heading. Again, most of the work is delegated to other methods. Note: Normally, parsing HTML with regular expressions is a Bad Idea™. It’s better to use a real HTML parser. In PHP that would mean using DOMDocument and friends. However, in this case we’re not just parsing HTML – we’re modifying it, too. DOMDocument is not really suited for modifying HTML fragments like WP posts as it will add extraneous <html>, <head> and <body> elements to the output. We could come up with a work-around or use a third-party parser, but that would unnecessarily complicate the plugin. Regular expressions it is, then. addTocEntry() uses a particularly handy WP function called sanitize_title() to convert each heading into a “safe” string that can be used as an anchor or a URL component. For example, sanitize_title() will turn “My Nifty Hēadiņg” into “my-nifty-heading”. To ensure that the anchor is unique, addTocEntry() also checks it against the list of already processed headings. I chose the first approach because the “name” attribute is no longer valid for <a> tags in HTML5. While this plugin does not specifically target any HTML standard, it’s still a good idea to generate valid HTML5 markup to ensure it won’t break any HTML5 themes. See this StackOverflow question for a deeper discussion. //No entries - no TOC. //Determine the minimum heading level. The first half of the buildToc() method is fairly simple – check if there are any entries to display, make a container element, set its CSS classes and add a title (if any). The first heading we find won’t be a H1 – that’s usually reserved for the post title or the site name. The first heading will normally be one of the highest-level headings used in the post (e.g. a H2), but it’s not guaranteed to. Some heading levels might be skipped, e.g. H2 followed by H4. The plugin these problems by figuring our the minimum (= highest importance) heading level ahead of time and keeping track of the current level. Whenever it encounters a lower level heading, it creates the required number of nested lists to “descend” to that level. On the other hand, when the current entry is a higher level heading, the plugin closes the required number of lists to “ascend” to that level. In each case, the output string ($html) is left in a state where it’s ready for the next TOC entry to be added. Hey, aside from the rather plain title, that TOC actually looks pretty good! Maybe we can get skip adding any CSS and just ship the plugin as-is? Now we need to add the stylesheet to the pages that contain the shortcode. To do this, we’ll use the wp_register_style() function to register it during the “wp_enqueue_scripts” action, and the wp_enqueue_style() function to enqueue it from the doTocShortcode() method. //Add our stylesheet to pages that contain a TOC. If you haven’t already done so, you can download the completed plugin in the Resources section. Add a link to the comments to the TOC. This one is fairly easy – the comment area usually has the ID “comments”, so you could just add a TOC entry with an anchor “#comments”. Add “Back to Top” links. Hint: Instead of trying to figure out where each section of the post ends, you can them before or after each heading + one at the end of the post. Add the TOC automatically if no shortcode is present. You’ll probably need need a way for the user to specify settings for auto-generated TOCs. See Settings API. You can detect if the current post is split into multiple pages by checking if the global variable $multipage equals 1. The number of pages is stored in the $numpages global, and each page’s contents – in the $pages array. You can use the _wp_list_page() core function as a template for generating URLs to different pages. Add a visual editor button. See the TinyMCE Custom Buttons page in the WordPress Codex. Add a Show/hide button, like on Wikipedia. A little bit of jQuery makes this easy. Remember to be a good citizen and only add your script to pages that actually contain your shortcode. That’s it! I hope you found this tutorial useful. If you have any questions, please leave a comment below. This entry was posted on Tuesday, June 19th, 2012 at 13:44	and is filed under WordPress Development, WordPress Plugins. You can follow any responses to this entry through the RSS 2.0 feed. You can leave a response, or trackback from your own site. Cthulhu generated this page with 53 queries, in 0.932 seconds.